As the United States marks its first presidential election of a new century, Witcover shows us how professional mercenaries -- with little party loyalty and diminished political principles, driven by an insatiable need for money -- are poisoning public life. At the same time, politicians themselves have condoned and even encouraged these developments, responding to the demands of a media-driven age in which the press corps pursues its own quest for celebrity and financial reward. Sharp, revealing, and rich with anecdotes, No Way to Pick a President offers a wealth of presidential history, from the role of the vice president's office to campaign funds, television and the electoral college. 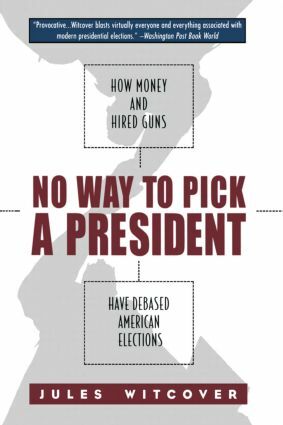 "Praise for the hardcover edition of No Way to Pick a President(0374223033):." Jules Witcover, a nationally syndicated columnist for The Baltimore Sun, has been covering Washington politics for almost half a century. He is the author of ten books, including the best-seller Marathon, about the 1976 Carter/Ford race. He is also the co-author of four works with Jack Germond.